I look at this mess every time I open the medicine cabinet in the downstairs bath and hate it so much that I haven't opened it in months. Today I am tackling this mess and taking care of it once & for all! I checked every script, all but one went in the trash (if you have any narcotics it's best to dispose of them at a local drive or flush them rather than toss in the garbage). Everything expired was disposed of. 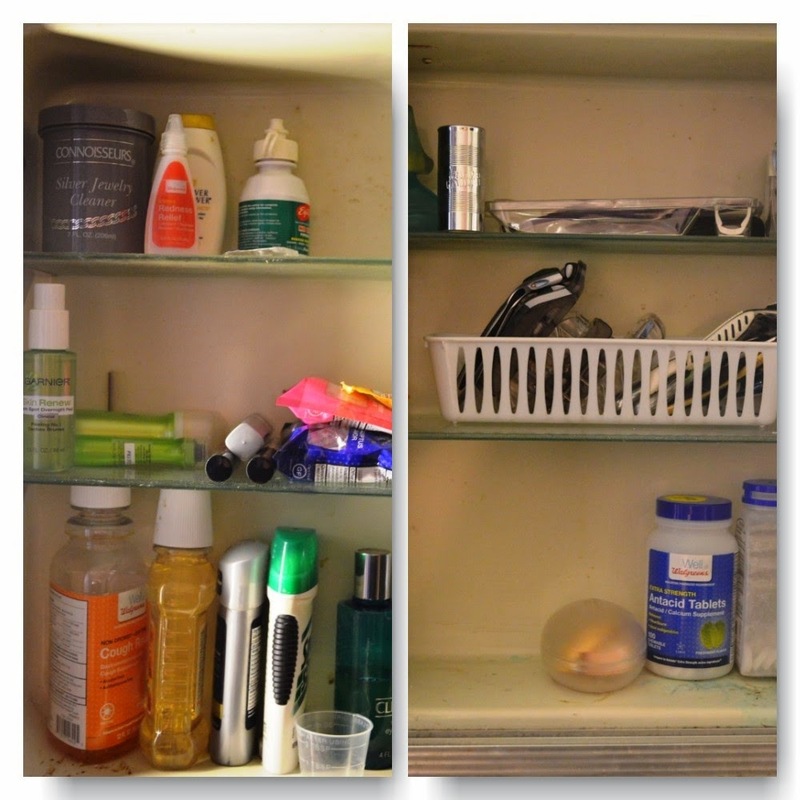 I used one of those Dollar Tree storage containers (white thing on the middle shelf on the right that looks like an open pencil case) to store all of Paulie's replacement razors and handles. It's a great way to create an additional boarder within the storage unit for those smaller items that have a tendency to avalanch each time the door is opened. Did I mention that this is the original 1942 cabinet with lights on either side from the original house build? It has some dinged spots inside from years of use so it's not pretty and new but absolutely functional, for now. On the left hand side on the center shelf are three packs of cough drops but I think they might be better stored in the fridge so they don't go through temp changes. The sugar content in them would essentially turn them in to a glucose bolder from fluctuating humidity. 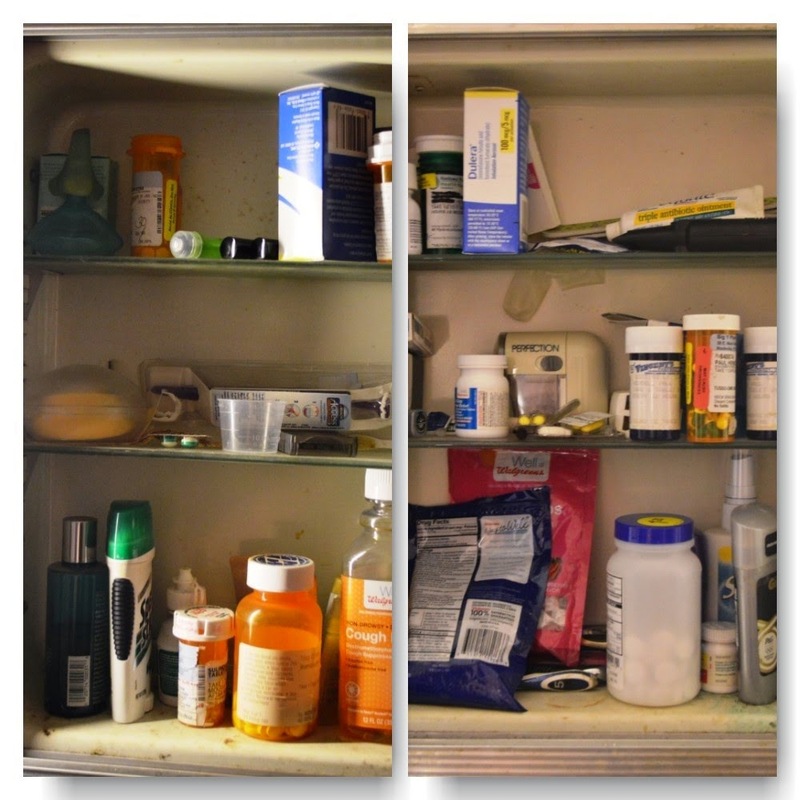 Notice there are no more medications, well that's because I have them in a silver box and to keep them out of the prying eyes of guests, you know everyone looks inside the medicine cabinet when at someone else's house. Have you? This will change slightly over the next few days only because I will check what's in the cabinet upstairs and whatever else is floating throughout the house that should be returned to the bathroom but I really like having some blank spaces for those migrating items.